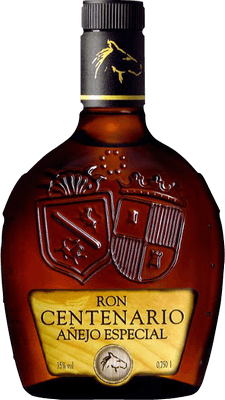 Have you found an online vendor selling Ron Centenario Anejo Especial? Enjoyed a bottle of Ron Centenario Añejo Especial while vacationing in Costa Rica. Unique bottle and label design, definitely stands out. Light brown color. Strong woodiness and plenty of vanilla to the nose and palate. This is a very dry rum, so better mix it up. Whisky lovers can add 2 points. Never heard of this rum, but was surprisingly nice. Not a rum that makes you scream for more or makes you want to use it like paint thinner to remove paint from your bathroom wall. It has some nice flavors going on though not much complexity per say. Vanilla and caramel, some dried fruitiness with a hint of spice and astringent. Makes a better mixer than sipper but don't be dissuaded from trying it neat or with an ice cube to bring out other flavors in the rum. Sugar 16 to 20 GPL. At first sniff I detected some petroleum, and this is going to be harsh but I was surprised. A semi sweet rum with a noticeable taste of honey and vanilla in it. Very smooth with no harshness and a nice warm finish. Other than the honey and vanilla taste, it doesn't have much of a taste profile. Overall it is a pleasant tasting rum that you could mix of sip with no problems. It is "Rum Lite" when compared to the aged Ron Centenario products, but still a good rum at a reasonable price. There is nothing smoother then this rum. I recommend everyone to get this. I bought it in Costa Rica for $45. It goes great with come. I would say it is quite good. No bad smell or taste. In this price category very good. If you are looking for something cheap, try this one. But dont expect much. A pretty decent rum for its price. I'd almost say a bargain. A nice Christmas present I guess. Before the new labels, this was the only one centenario rum in market; I think it is the same of 5 years. In general a good mixing with coke. It' s been a few years since I tried this rum but as I recall it was a really good sipping rum. Smells fantastic and really hits the spot on a cold winter night. I received this as a gift so I have no idea how much it costs. I try to rate based on the price, it's not fair to compare a $100 rum to a $20 rum, so take this rating with a grain of salt. I've had similar rums in the $35-50 range. Aroma en Smaak: karamel, vanille. Nasmaak: zoet, maar niet lang. Een lekker zacht rummetje uit een Solera systeem. I found this at a small liquor store in my area but haven't found it since. It comes on sweet and finshes with a little alcohol bite but I really like it. Cost drops it to 7. Voilà un rhum clairement au-dessus des rhums de sa catégorie. Un rapport qualité/prix vraiment exellent compte tenu de son coût moitié élevé que la plupart des rhums agricoles du même âge.